Wednesday 7 November: Up-anchor from Herring Harbor MD and motor to Deltaville VA. And a cockpit lamp manufactured on the way. 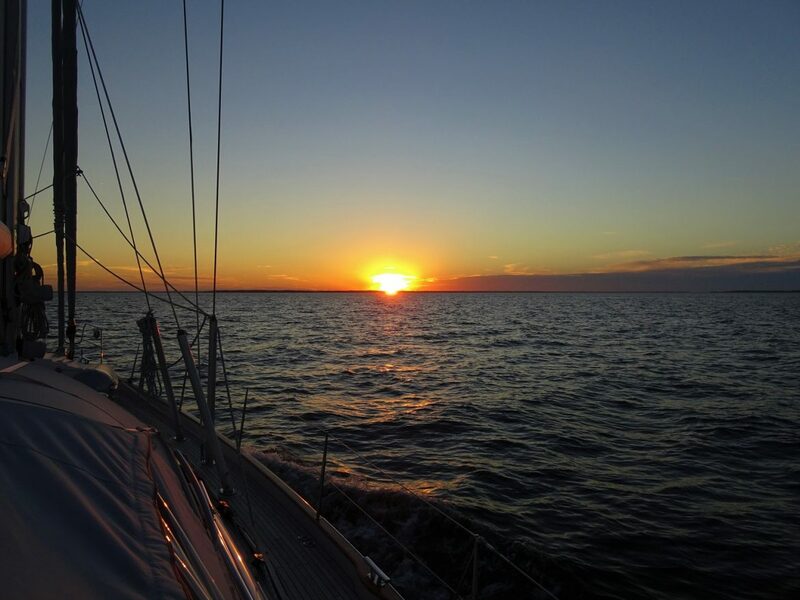 Long journey today, we head down on the Chesapeake Bay and we aim for Deltaville, 80nm away. So we’d better start early. By 7.30am anchor up and we are on our way just after sunrise. Beautiful bright morning, clear blue sky, with the sun soon warming up our cockpit tent. We don’t see much through the windows, all covered in condensation. But we see it’s sunny! So Glen takes action, wiping all the windows. That’s better. Hardly any wind, we have no choice but to motor. And as we sit in the cockpit listening to the engine, we comment that it’s smoother and quieter after we changed the cutlass bearing. We feel no vibration in the floorboard anymore. To chase the boredom away we flip through the pilot book, looking at pictures of all the places in Chesapeake Bay that we didn’t get to see. It must be such a beautiful area in the summer, has the same prettiness we saw in Long Island NY. We also do a VHF check, to see how reception is after we had it fixed two weeks ago. Result: loud, clear and very strong, even from a yacht listening 22 miles away. That’s what we like to hear:) Such a relief to know it works OK now. Glen investigates on the chart on potential places for us to stop at. And we contact a couple of marinas to inquire about transient berths. From one we get a prompt decline. YC members only. Snooty! The other is $2/ft. Times almost a week while we wait for weather window, that’s too much, thank you. We then turn to the OCC. We email the port officer in Norfolk VA, Gary and Greta, and we get a prompt reply. We can dock on somebody’s private jetty there. Perfect! When Glen has had enough of the chart plotter, Predict Wind and emails, he moves onto practical stuff. Domestic this time. He has two cupboards full of items that are pending some sort of action, which he affectionately calls “projects office”. Today he did an inventory of what’s in there to remind himself and line up jobs. And the first opportunity arises: making a cockpit lamp. A bit of a weird project, I know. Here is how it came about… Last year we used to have a Chinese drone which sunk in Greece. We saved two 12v Li-Ion batteries from it, which were brand new. And instead of just throwing them away, we thought long and hard how to put these batteries to good use. 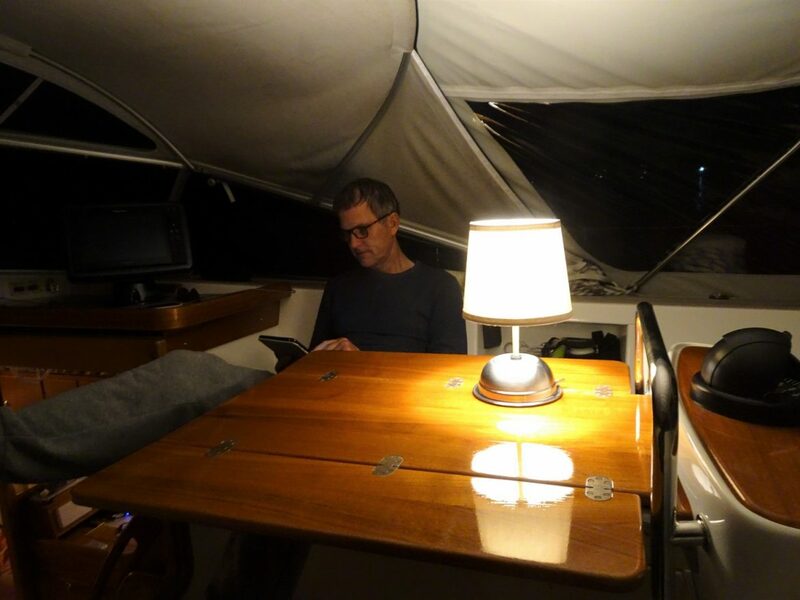 That’s how the idea of a wireless cockpit lamp came into the picture (enough of torches and camping-like lights). I have asked for one that would give enough light when we have drinks or dinner in the cockpit, and would look good too. So, shopping list was created, with all bits and pieces needed for the job. Most important item, the lamp shade, we only just bought three days ago. So now the manufacturing process can begin. It will certainly look very interesting, with a dog bowl as a base! 🙂 As expected, for something coming out of Glen’s hands, it turns out beautifully! Not to mention it is a truly international lamp! The battery comes from Dubai, via Spain and Malta. The switch is from Gibraltar. The base is from Canada. The stem is from Long Island NY, lampshade is from Annapolis MD, USA. The light fitting is from Romania. The LED bulb from UK. And the wire from Cloudy Bay’s treasure chest, the bilge. How about that, for a long planned international project!? No sailing today, only motoring. The very little wind, 3-7kts, is dead on our nose. Watching for fishing floats has returned into our lives, how annoying. As we scan the horizon for the little buggers, we spot a rusty ship. Not shallow enough here for it to run aground, so it must be anchored. It raised our interest, and when we look through monocular we see it is full of holes. Then we see on the chart that it is used as target practice and has a do-not-enter zone around it. It gets dark very early, sun sets at only 5pm now. And we still have quite a bit to go till the planned anchorage. We arrive in Deltaville after an uneventful motoring day, 83nm in 10h30’, and drop the anchor at 6pm in pitch black. Dark? No problem, we have a new lamp! How amazing is that?! It gives a beautiful glow in the cockpit, lighting up the whole tent. Needless to say I am very happy! And we didn’t spend any money today. Double happy! Later in the evening we are less happy though. No phone coverage here, hence no internet. And during the usual daily inspection of the engine room, Glen noticed that the newly redone sea-strainer fittings are leaking. There’s no pressure on them, so we can’t understand why they are leaking. That’s 2 types of pipe gloop we’ve used for that leak. He thinks we will simply go back to the good old Teflon tape method next time. Another long evening in the cozy saloon with the heater on while Oana finalizes another video. She’s getting pretty slick with this new Adobe Premier Pro software and the new super fast DELL PC and gaming graphics is working wonders with the editing and playback. Finally we will be able to start shooting and editing in full 4K resolution. Once you’ve watched in 4K you really don’t like any lesser resolution. 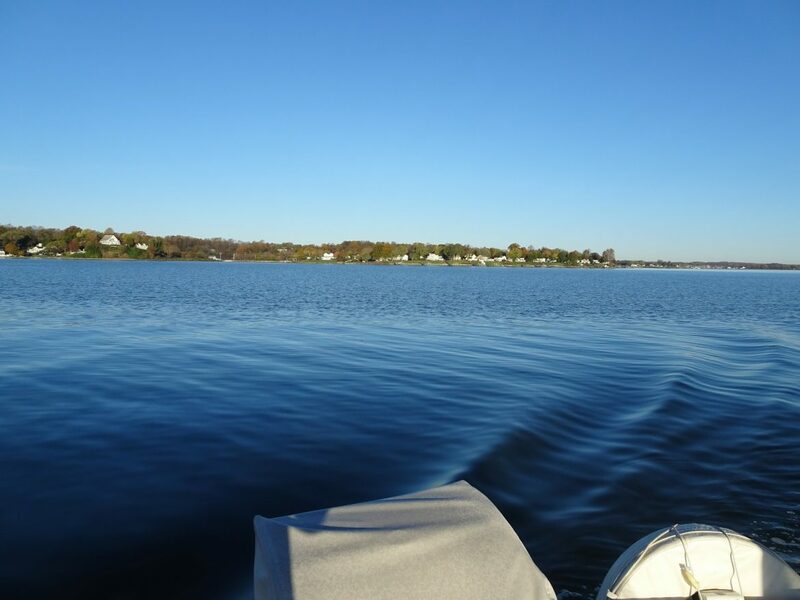 It was a nice day… and tomorrow we can look forward to some wind and actually sail for the first time in 2 months we arrived to Edgartown, near Annapolis.